mild mannered, honest and lovely dog. 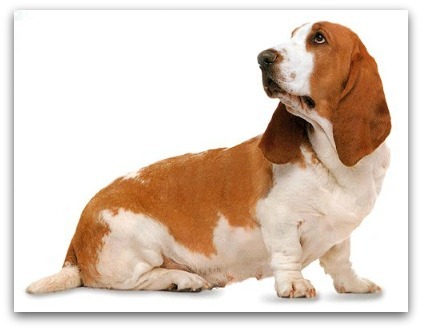 Basset Hound originate comes from Great Britain and France, these breed was specialize bred as a hunting dog, most used to hunt raccoons, foxes, rabbits and other small animals, and can also be used to game bird. Now has about 100 years old. They Has a very keen sense of smell. When Is chasing prey and will giving a deep and unique voice, so is well known because of these unique voice. From 1880 onwards, it was taken to the United Kingdom, these dog breeds in the United Kingdom and the United States a high reputation as an ornamental dog. This breeds of dogs was registered with the AKC in 1885. The coat is short ,hard and smooth-intensive. The coat color comes from the black, yellow brown and white, white and tan, red and tan. there are also have lemon and white or other color hunting dogs. They have a very relaxed and always a sad expression. Training a Basset Hound is challenge. They is known to be more difficult to train than other dog breeds. It's because they is a very independent breeds of dogs. These breed may be a sensitive and stubborn dog breeds. So the training should train with gentle, fairness and firmness, consistency with a patience attitude. They may be difficult to housebreak. Grooming the basset hound should brushing and combing with a soft bristle or a curry bomb on a regular basis. Eyes and ears should clean regularly, it often need to drop a number of eye drops to keep eyes clean. Bathe when is necessary with using a mild shampoo. As a pet he has a gentle, loving, and great of humors sense nature and is friendly with everyone. You'll enjoy his company both at home and in public. He can be a great companion for an individual or for family.